Does Doing An Elimination Diet Scare You? 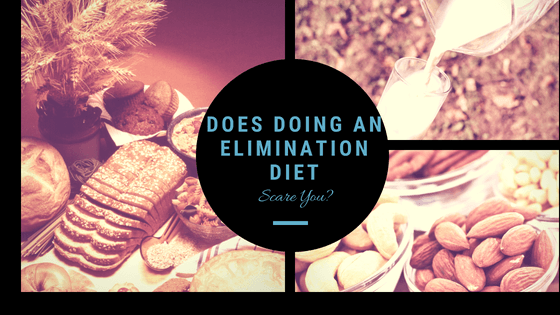 Are you scared to do an elimination diet? Have you ever planned on doing one and just felt overwhelmed, didn’t know exactly where to start? Or maybe you started but it was just too much work to finish or what’s more frustrating you couldn’t figure out your “trigger” foods after all of that hard work. I’m here to tell you it can work, remember the more work the greater the payoff. Most importantly, you don’t have to go it alone. An elimination diet is the process of removing foods from your current diet that are most likely “trigger” foods, causing a negative reaction in your body. Some examples of these types of foods are processed foods, fast foods, foods that are high in sugar and fat, sometimes foods such as gluten, dairy, corn, soy, eggs and nuts can be trigger foods for some people. The process of removal will last for 6 weeks, this gives the body time to rest. It allows inflammation to quite down so symptoms decrease and healthy feelings increase. Don’t worry, you won’t starve, your goal will be to focus on foods that are of the highest quality, anti-inflammatory, nutrient dense whole foods. Once you have reached 6 weeks you can start to reintroduce the foods that you have eliminated back into your daily routine (of course not the processed foods, fast foods, and high sugar and fat foods). You will do this methodically, one by one waiting a few days in-between. By doing this you are able to test your reactivity and symptom recurrance to each one of the foods you originally eliminated. This helps you figure out what foods work for your body and what foods don’t. Are you ready to eliminate? Who can an Elimination Diet help? An elimination diet can be extremely helpful for those who suffer from a variety of health issues and unpleasant symptoms. If you suffer with food intolerances or food sensitivities, battle IBS or IBD, chronic constipation or diarrhea, autoimmune disorders like Rheumatoid Arthritis, heartburn/acid reflux, depression or insomnia, chronic fatigue syndrome, psoriasis, chronic muscle or joint aches and pains or even the inability to lose weight you are in the right spot. Keep reading to find out why you are a good candidate for an elimination diet. Why Do An Elimination Diet? So many suffer from food intolerance and food sensitivities and elimination diets are the gold standard for identifying these problems. But, elimination diets can do so much more for you and your health. You will quiet the inflammation. Almost all chronic diseases from weight, to fatigue to a multitude of digestive issues can be linked back to inflammation. When you remove all commonly known inflammatory foods with an elimination diet it gives your body a break and allows that inflammation to quiet down. You will have more energy. Are you currently experiencing fatigue, are you tired when you wake up in the morning, are you tired all day, do you experience that 3pm crash? What about brain fog, do you constantly feel as if you are in a daze? When you remove trigger foods and quite down inflammation your brain can think and function better. Your body will feel more energized! You will start to feel like a new person. Your potential for pinpointing food intolerances or food sensitivities goes up. When working through an elimination diet the guesswork for pinpointing trigger foods goes down. You may already suspect some foods but unless you remove them from your diet for a specific amount of time and then “challenge” or “reintroduce” them back into your diet you will keep wondering which foods are really causing you to feel lousy. The opportunity will arise for you to find the foods your body loves. You will have the opportunity to find the foods that make you feel healthy, make you feel good. When working through an elimination diet you will be using nutrient-dense foods that provide lots of vitamins and minerals, antioxidants and phytochemicals. Foods that you can include into your diet that most likely will not cause an adverse reaction. Your immune system will get that needed BOOST. It doesn’t take much to cause an inflammatory response in your gut, all it takes is food. And what’s worse is your immune can take a hit at the same time. The elimination diet is all about using anti-inflammatory foods that help decrease inflammation and strengthen your immune system. You will become more thoughtful of the foods you eat. Once you start feeding your body really good food you will be more thoughtful to do so in the long run. Good nutrient dense foods contain the nutrients your body needs and deserves to function at a healthy level. You will have the opportunity to truly appreciate the taste, texture, and quality of whole foods versus fast foods or processed foods, foods high in sugar and fat. Your intake of processed foods will decrease dramatically. Did you know that processed foods are formulated to be addicting? Yes, that’s why you can’t stop eating them. Unfortunately, these foods that make up most of your diet are devoid of any nutrients worth speaking about. What they are most known for is creating chronic disease. You will give your body the much needed love it’s looking for. An elimination diet is about self-care, focusing on what you need to become healthy. It’s not about the newest fad-diet or starving yourself. It’s about feeding your body with nutritious meals that will make you feel nurtured and replenished. I’ve noticed that once my clients see how taking out the crap can get them feeling better they work on incorporating more and more food “medicine” versus replacing feeling good/feeling healthy with processed foods. This will give you an opportunity to create a customized nutrition plan that works for you. It’s important to know that not every “healthy” food may work for you. There are plenty of people that find that a certain “healthy” food might actually be a trigger food. Everyone is different, again the reason for the elimination diet. To see what foods work for you and what foods don’t. Once you have gathered your information you can create nutrition plan that works for you, that creates health for you. Your gut will finally be on the road to healing. Everything starts in the gut, even chronic disease, autoimmune disorders, obesity and so on. By removing triggers, toxins, foreign substances you allow your gut to finally begin the healing process, reversing underlying gut damage you may not have even known you had. What can you eat on an Elimination Diet? Keep in mind, the more you restrict you may find yourself getting better results much quicker. *Thrive Market is a fantastic place to buy high quality, organic foods. I do have an affiliate link where I earn a very small commission if you decide to use it. The downside to an elimination diet is there is still guesswork involved. It takes a lot of dedication, patience and detective work to figure out your “trigger” foods. It certainly can be done but pairing it with food sensitivity testing can make a world of difference. The benefits of doing food sensitivity testing are the results. You immediately (or within a week or so) know what your immune response is to the food and food chemicals tested. So, removing these foods from your diet plus others that may be triggers based on symptoms is like a double punch to the gut! If you are curious and would like more information on food sensitivity testing and how it works check out my blog. Fill out this symptom survey, so you can get an idea of the level of inflammation you have going on in your body. This valuable information will help guide you on your next steps.